Mount Happy Nagar is a gorgeous stone and wood cottage located in Naggar, the old town of Kullu. If you've been thinking about that solo trip, this is the ideal place to go to. Awesome hosts, complete privacy, picturesque surroundings, water streams. Mount Happy is one of the nicest little home stays up in the hills that's completely isolated from civilisation (and so pretty too). You can't beat the fantastic location; it's right up in Naggar amidst apple trees. Did we mention it's next to a river? 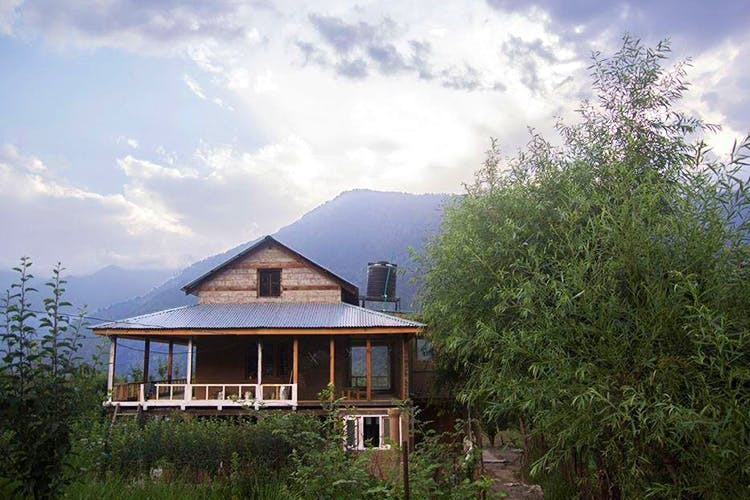 This stone and wood cottage is an old property that's been around for decades, and is your typical mountain lodge, with slanting roofs, cosy, wooden rooms, a library where you can curl up with a good read and a cup of hot tea.The host, Ankit, will ensure that you feel welcome with their homey meals—they provide vegetarian and non-vegetarian food, and it's simple stuff like mashed potatoes, mutton curry, eggs and plenty of hot beverages. There are multiple trekking and walking trails around, but what you really want to do is trek down to the river and have a picnic with your friends. You'll literally be the only ones there apart from their resident mountain puppies, and if you tell Ankit in advance, he'll send down packed lunches for you. Since it's an old house, the bathrooms are located outside, which can get a little scary at night. Ask to stay in the room in the attic—it's got an incredible view of the mountain peaks which is such a dream in the winter. They can host up to 10 people in the cottage and their deluxe rooms cost INR 1,000, and the rooms on the ground floor cost just INR 600 (they haven't changed the prices over the years).